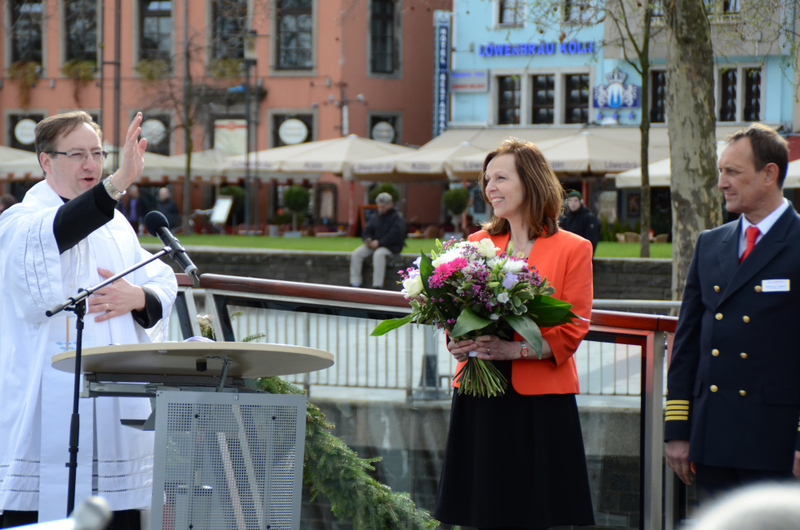 APT’s European team officially welcomed the latest Travelmarvel ship to the river cruise operator’s premium fleet recently, holding a special renaming ceremony in Cologne, Germany, for the newly refurbished vessel. The special event was attended by a party of around 100 VIPs and guests, including the ship’s Captain Volodymyr Tugayev and Travelmarvel’s Director of Operations in Europe and Russia, Trish Bannon, who enjoyed an on-deck reception prior to the ceremony. Ship christenings originated more than 4,000 years ago. A respected and well-known woman is selected to serve as a new ship’s honorary ‘godmother’, entrusted with blessing the vessel to ensure the safety of its passengers and crew. In the case of a refurbished vessel such as Travelmarvel Sapphire, the ship is renamed rather than christened. 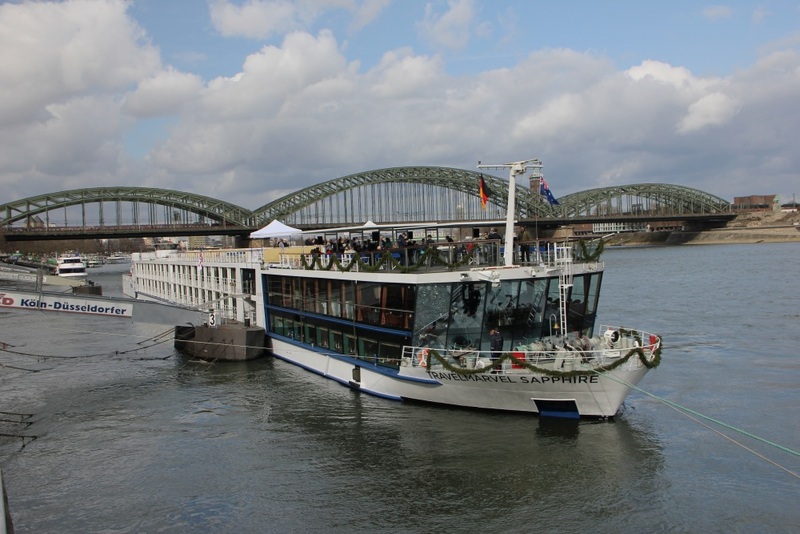 The Reverend Andrew Sillis, Chaplain of St Boniface Bonn and All Saints in Cologne, blessed the vessel, before the ship was christened in time honoured tradition with a bottle of Champagne broken against the ship’s hull. Following the ceremony guests enjoyed a panoramic cruise and Gala Dinner in the ship’s restaurant. The Travelmarvel Sapphire is 41-metres (135-feet) in length and has capacity of 164 guests. All category C cabins and above offer French Balconies, with Owner’s Suites measuring 21.5 square metres (232 square feet). Other facilities include a dining room, bar and lounge; sun deck, fitness room and hair salon. Guests also enjoy gourmet dining with all meals on board included, along with local wine, beer and soft drinks with lunch and dinner. Also included in the price of all Travelmarvel holidays are port charges and gratuities.